It’s been quite some time since I wrote about Sidecar Doughnuts. 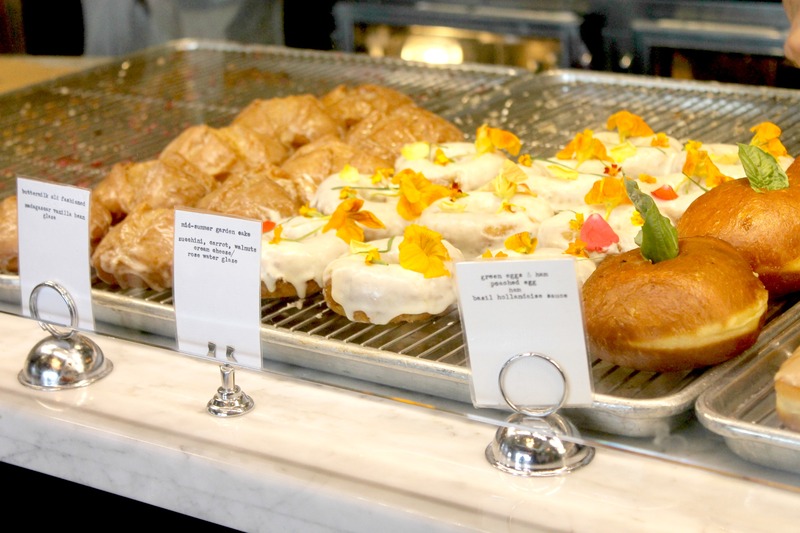 For those who aren’t familiar, Sidecar Doughnuts is a delightful doughnut shop in Costa Mesa that bakes fresh doughnuts daily made with all-natural ingredients and no preservatives. The Englishman and I pop in there every so often for a weekend treat, and when I heard about all the exciting things happening this summer at Sidecar Doughnuts, I knew I had to pop in and check it out. 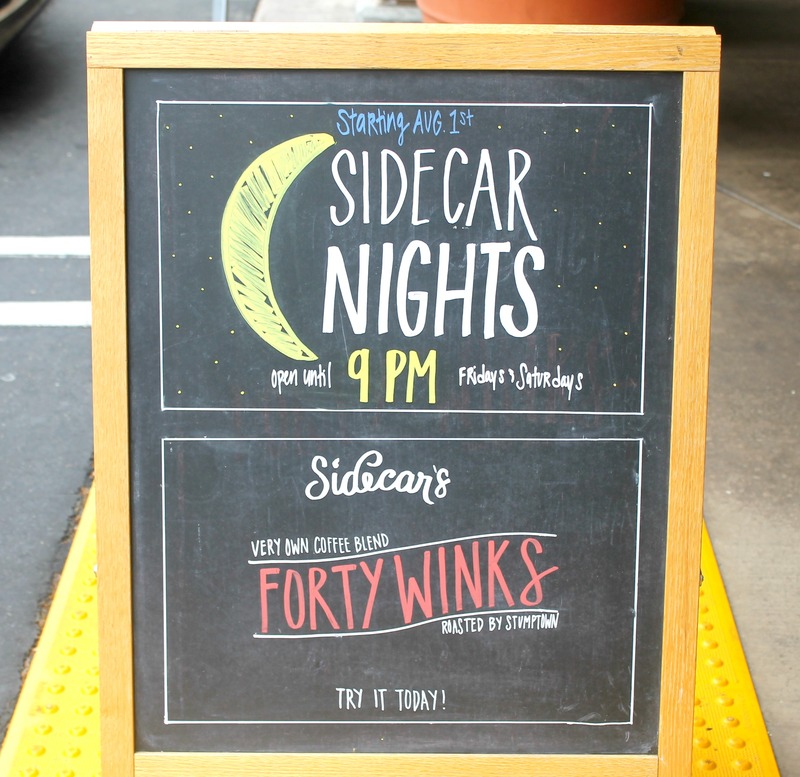 This summer, Sidecar Doughnuts is introducing what they call “Sidecar Nights,” where the shop will be open on Fridays and Saturdays until 9pm! Perfect for any time you have a doughnut craving after dinner. And since the doughnuts are made fresh hourly, you won’t have to choose from the morning’s leftovers. Psst – if you come in the morning keep your receipt for $2 off your doughnut later in the day! 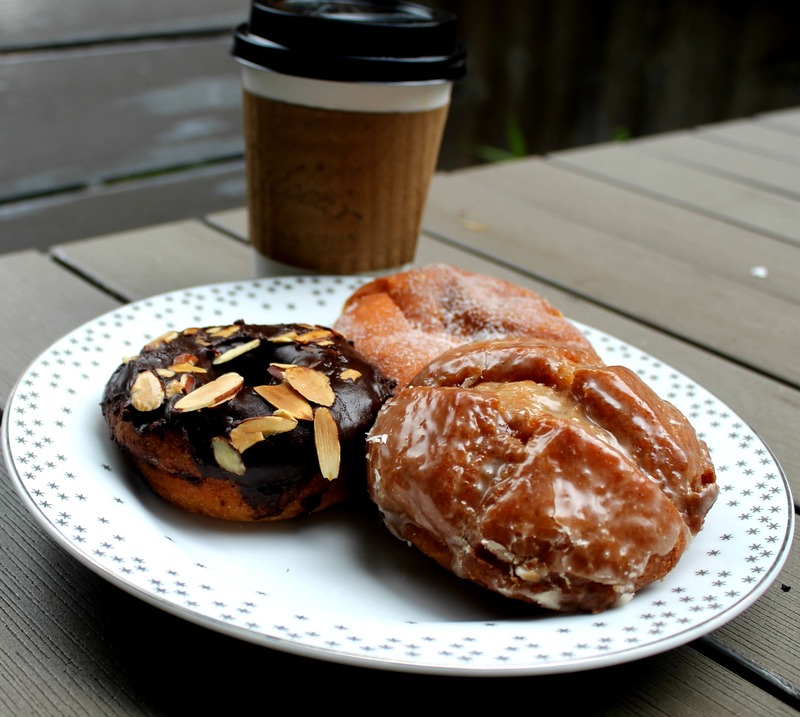 The other exciting thing happening this summer at Sidecar Doughnuts is the introduction of their signature coffee, Forty Winks. Admittedly the Englishman and I do not really drink coffee at all, but there’s something special about this blend. 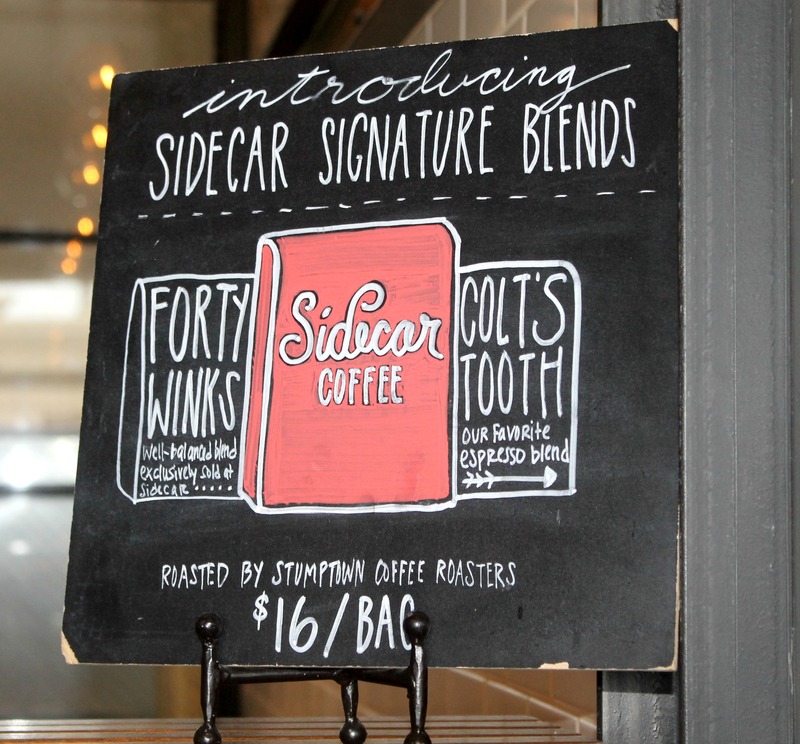 Sidecar partnered with famed Stumptown Coffee to create their Forty Winks blend and it is good. If you are a coffee enthusiast, I definitely recommend checking it out. Of course each month Sidecar Doughnuts introduces delicious new flavors and this month is no exception. Some of the August flavors include a Malasada doughnut with strawberry jam, a Mid-Summer Garden Cake made with zucchini, a Buttermilk Old Fashioned, and Fig and Goat Cheese. I’d like to think that the Buttermilk Old Fashioned was made in honor of my birthday month because it is that good. Lazy weekend mornings with coffee and a doughnut. Life doesn’t get much better than that. Now who wants to go get a doughnut with me? This entry was posted in Best Of, Breads and Baked Goods, Good Eats, Orange County and tagged costa mesa, doughnuts, summer on August 4, 2014 by allie@sweetpotatobites. Summer has finally hit in Socal. Every year we make our way through May Gray and June Gloom and then somewhere in August, summer strikes in full force. The only difference this time is that we have the added bonus of humidity which has me wanting quick and easy meals that don’t involve a lot of heat. 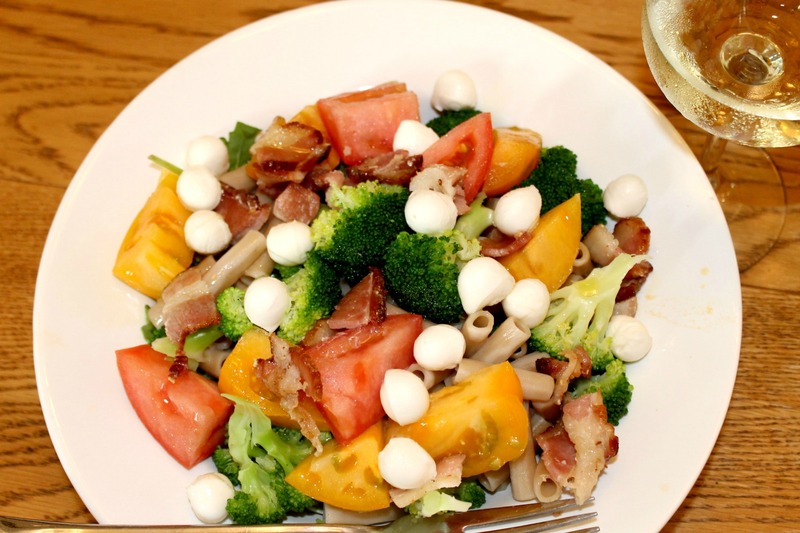 Enter the Bacon Mozzarella Pasta Salad. I like this pasta salad for a lot of reasons. First, it requires minimal ingredients and minimal cleanup, second it has lots of fresh summer vegetables, and third it involves bacon. Enough said. It’s an easy summer dinner that’s perfect when you don’t feel like cooking, and would also be a great dish to take to a BBQ. It also happens to pair really well with a crisp glass of pinot grigio. Bring a pot of water to a boil. Cook your pasta for 8-10 minutes or until al dente. Remove pasta from water and place in fridge to cool. In a large skillet saute your bacon until nice and crispy. Set aside. 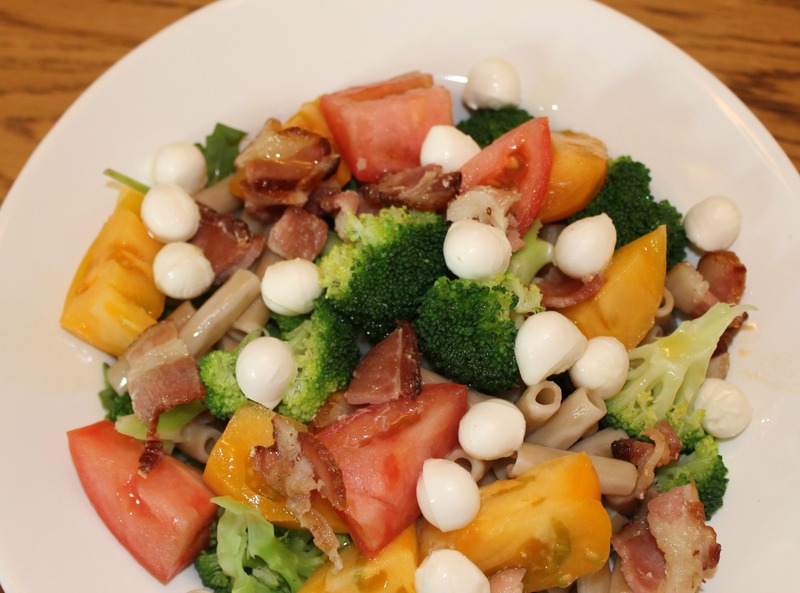 Place arugula and pasta in a small bowl and top with tomatoes, broccoli, mozzarella and bacon. Lightly drizzle with olive oil and salt and pepper to taste. Other great toppings for this salad include avocado, hard-boiled eggs and carrots. Any other pasta salad dishes I should try? What’s your favorite thing to eat when it’s hot out? 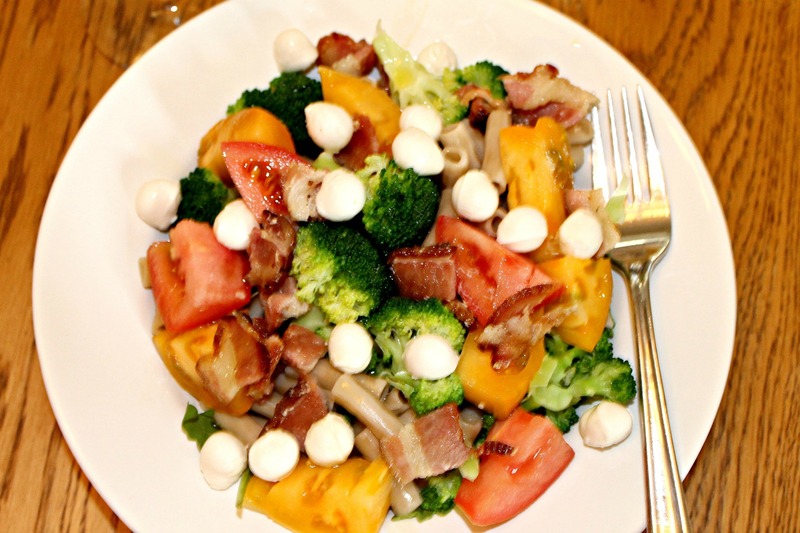 This entry was posted in Cooking, Dinner, Healthy and tagged summer on September 2, 2013 by allie@sweetpotatobites. Yes, I was tipped off to the fact that there was such a thing as Pimm’s Cup Popsicles(!) and immediately I started thinking of other booze-filled frozen treats, such as coconut rumsicles. 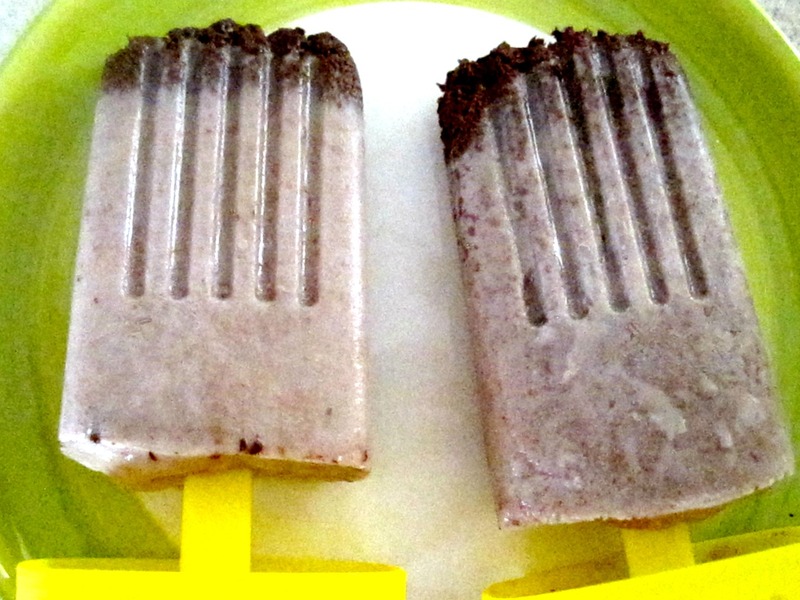 I kept this recipe pretty basic since it was my first foray into popsicle making thanks to these popsicle molds from Amazon (which work great btw) and just used three ingredients. 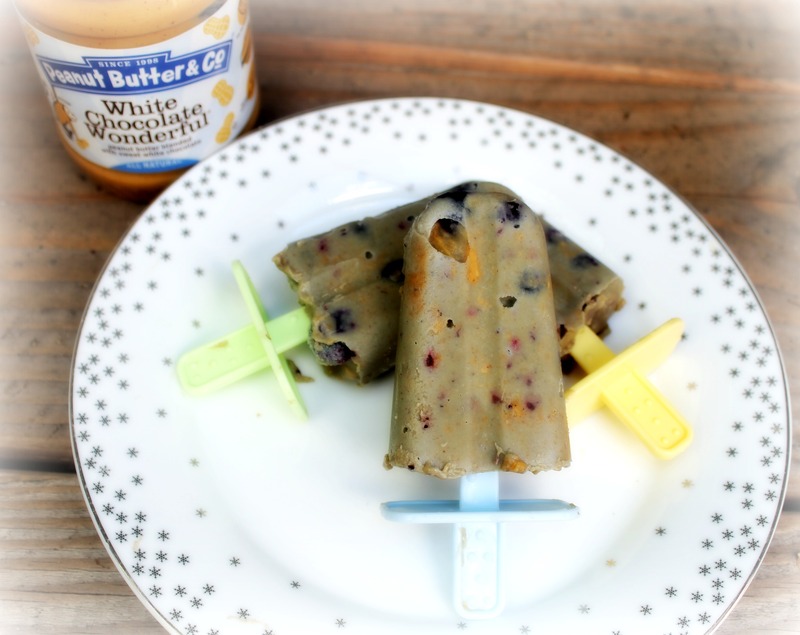 The rumsicles are definitely more “icy” than creamy, so if you are looking for a creamier frozen treat, I recommend adding some coconut cream as well. 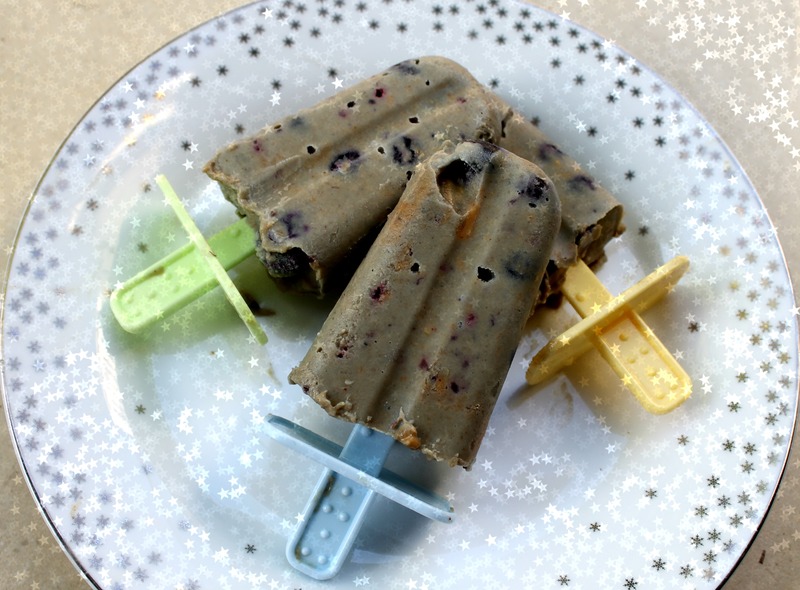 These frozen treats are also made with dairy free chocolate chips, so they are perfect for anyone on a dairy-free or vegan diet as well. The rum definitely adds a nice burst of flavor, but if rum isn’t your thing, feel free to omit. I get the feeling that booze-filled frozen treats may become a summer trend in our house. 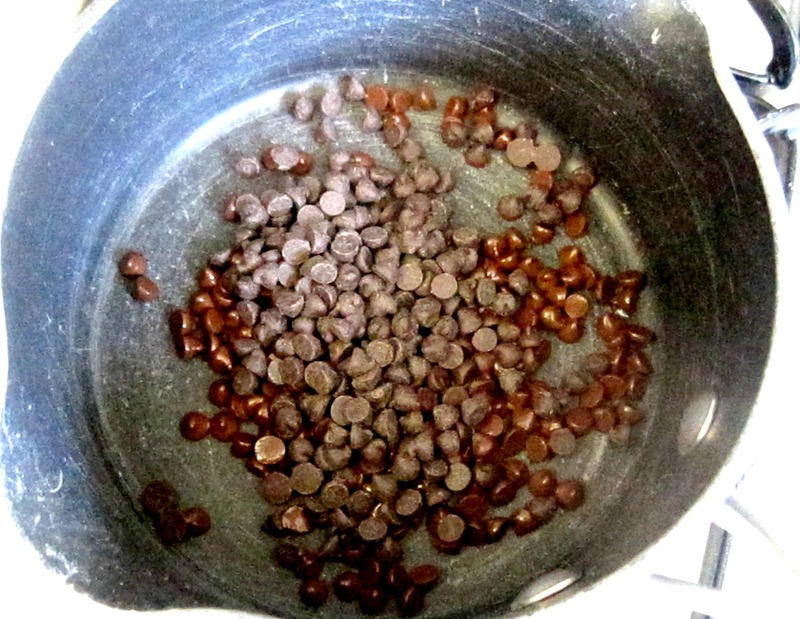 In a mixing bowl blend your coconut milk and rum and slowly fold in the melted chocolate into the coconut milk and rum mixture. 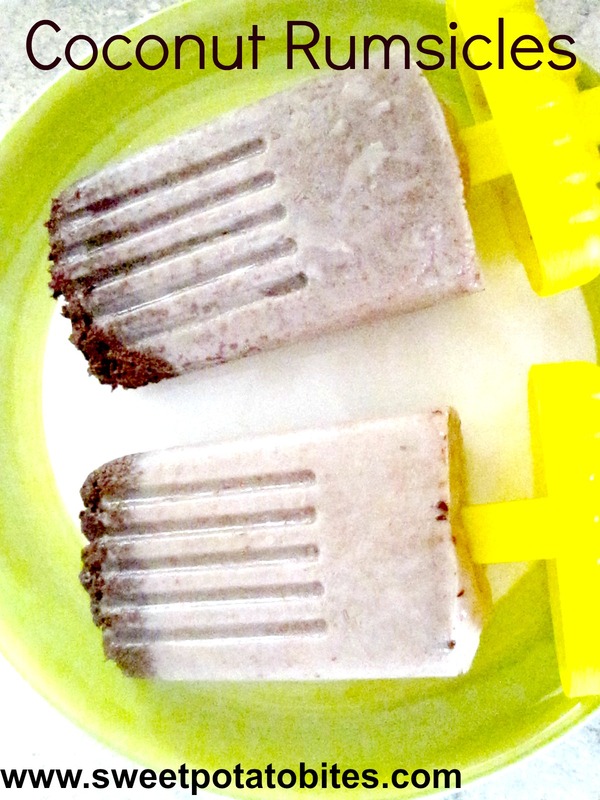 Gently pour the mixture into your popsicle molds and place in the freezer. 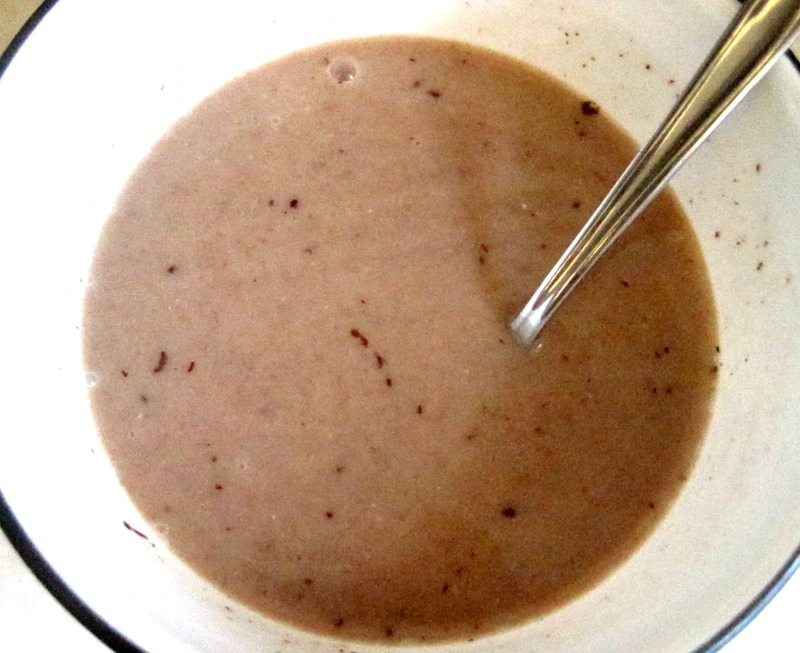 If you want to make a booze-free version, just use coconut milk and chocolate. Let the popsicles freeze for 3-4 hours, then enjoy! What should my next booze-filled popsicle treat be? 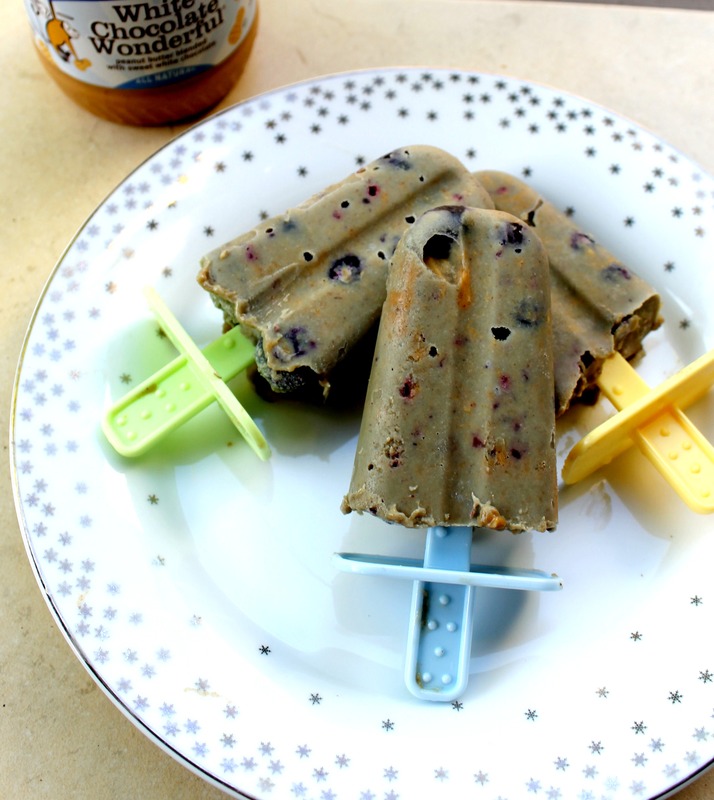 This entry was posted in Dessert, Vegan and tagged frozen dessert, summer on July 5, 2013 by allie@sweetpotatobites.